Emile Durkheim (1858-1917) was the first to take a position in a university and because of the scientific journal he edited, L'AnnŽe Sociologique (the sociological year) and his scientific work, he was able to help sociology to become part of higher education's academic culture. He was also French and took the first position at a university as a sociology professor. Durkheim discussed Social Facts, a phenomena within society that typically exists independent of individual choices and actions. Durkheim approached a subject that most thought of as being exclusively individualistic in nature-suicide. But, he defined suicide from a social fact perspective which helped him to establish the unique wisdom of sociological analysis. To Durkheim, individual people don't cause suicide, suicide is a social fact that some members of society participate in for various social reason. Durkheim studied suicide among categories of people in various contexts in Western Europe. He found 4 distinct types of suicide that occur as social facts and that could be collectively remedied by adjusting social processes. Before we explain these let's look at 2 core sociological concepts. Social Integration is the degree to which people are connected to their social groups. 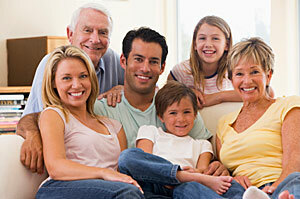 Let's check your own personal degree of social integration. On a piece of paper right down how many close family members you have. Then add in how many close friends and coworkers you have. Finally add in all others whose name you know and they know yours. This number is one measure of your social integration. But, to really get an idea you might evaluate these relationships. In other words list your top 6 closest relationships in order. Make a short list of the 6 closest relationships you have. Now, rank 1 for the closest, 2 for next closest and so on up to 6th. Durkheim realized from his suicide studies that the closer we are to others, the more socially integrated we are and the less likely we are to commit suicide. The second concept to understand is called anomie. Anomie is a state of relative normlessness that comes from the disintegration of our routines and regulations. Anomie is common when we go through sudden changes in our lives or when we live in larger cities. Sudden changes bring stress and frustration. To illustrate this, I often tell my students to remember how they felt the day after high school graduation. They walk for graduation then wake up the next morning with very few demands on their time and energies. This sudden shift in demands from very intense to almost absent, leads many to feel extremely frustrated and lost. Add to that they are now adults and no longer students (children) and you get a prime formula for anomie (role shift + vague expectations about what is expected + sudden change=anomie). One of my college students told me that at the end of last semester she had 4 finals, one paper, two presentations, and one lab project all due in the last 5 days of class. She finished it all, packed, and moved back home. The first morning she woke up at home she got out her planner and realized that all she had to do that day, in other words all the demands placed upon her were to eat and shower. She was not a full-time university student for now and was between significant roles. "It took a week to get my life back into a routine for the break," she explained. As a larger social fact, anomie is a byproduct of large complex societies, especially around large cities. It's easier to get lost in the crowd, not be noticed, and to rarely receive praise or criticism for personal actions. Durkheim and others were aware that society impacted the life of the individual even if the individual had very little impact on society. By the way, Durkheim measured suicide rates and so do we in our day. Suicide is the purposeful ending of one's own life for any reason. Suicide Rate is the numbers of suicides per 100,000 people in a population. Durkheim's first 2 types of suicide had to do with the degree of social integration of the individual into their groups. Altruistic Suicide is suicide which occurs when people are over involved and over committed to a group or society as a whole. This occurs when the needs of society as a whole override the needs of the individual. Soldiers often do this to protect their comrades. Egoistic Suicide is suicide which occurs when people are under-involved or under-committed to groups. This is the loner-type suicide when an individual is disconnected (or never connected) to others. Certain social pressures isolate us more than others and suicide becomes more risky for the isolated. Certain social forces within society create this isolated state within us (TV viewing, video games, online time, and other solo activities that preoccupy us with our own interest and isolate us from our groups and relationships; see www.youtube.com and search "James at war Halo3" for a humorous example of technology isolating us from others). Interestingly, the Suicide Prevention Resource Center gives a few suicide prevention strategies that relate to social integration:. "Strong connections to family and community support cultural and religious beliefs that discourage suicide and support self-preservations and various other types of social support are recommended" (retrieved 13 January, 2009 from www.sprc.org the "Risk and Protective Factors for Suicide," National Strategy for Suicide Prevention: Goals and Objectives for Action, 2001). Interestingly Durkheim's work is quoted multiple times on this Website. The next 2 types of suicide described by Durkheim have to do with the levels of social control and social regulation. Anomic Suicide is suicide which occurs when people are under-regulated by familiar norms that serve as anchors to their social reality. You'd expect this type of suicide in very large cities or when dramatic social changes have transpired (IE: 9-11 terrorist attacks or recent economic recessions). Fatalistic Suicide is suicide which occurs when people are over regulated or over-constrained. This might happen in oppressive societies where people prefer to die rather than continue under the hopeless state of oppression (IE: prisoners of war, inmates, and refugees). The US Center for Disease Control list Suicide as the 11th most common form of death with about 32,000+ US suicides reported last year. That's a rate of 11 suicides per 100,000 living people (retrieved 23 April, 2009 from Suicide and Self-inflicted Injury at http://www.cdc.gov/nchs/fastats/suicide.htm ). In Durkheim's day he found highest suicide rates for Protestants, males, singles, and wealthy persons. He found lowest rates for Jews, Catholics, females, marrieds, and poor persons. Many of these are still common predictors of suicide today. 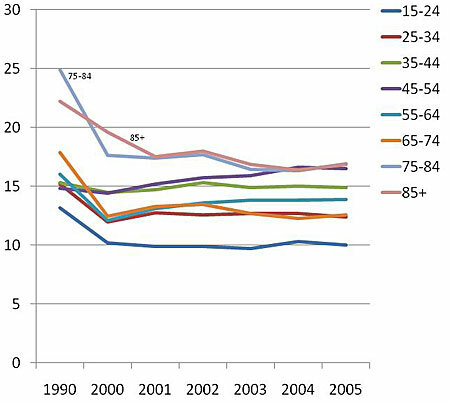 The World Health Organization reported that worldwide the suicide rates show clear patterns being higher for males at all ages and especially higher for the elderly (retrieved 23 April, 2009 from http://www.who.int/violence_injury_prevention/violence/global_campaign/en/chap7.pdf ). This report also noted that the highest suicide rates in the world were reported in: Lithuania 51.6; Russian Federation 43.1; and Belarus 41.5/100,000 population. Interesting isn't it at the 3 worst countries are geographically close together? Durkheim found geographic patterns within his researched countries, too. The countries with the 3 lowest suicide rates were: Azerbaijan 1.1; Kuwait 2.0; and Philippines 2.1/100,000 population (*retrieved 23 April 2009 from World Report on Violence and Health, Table 7.1, "Age-Adjusted suicide rates by country from www.UN.org English). Look at Figure 1 below to see a recent pattern of suicide rates in the United States. Since 1950 male rates (red line) have gone down overall, but did experience a slight increase in the early 1990s. Male's rates are the highest. The blue line is the combination of males and females into the total and it parallels the other lines about mid-range. The green line represents females. 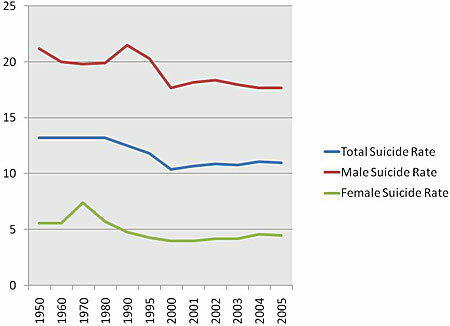 Females typically commit less suicide than males in most countries of the world. I use many figures and charts in this books so let me just point out a few tricks to reading them. Look at the legend on the side or bottom of the charts. It tells you which lines represent which categories. Also look at the title to make sure you read the details of what is being represented. Now let's consider the US rates by age. Look at Figure 2 below. Ironic, isn't it that the older persons (persons with the most wisdom and experience) would have the highest suicide rates? The 75-84 and 85+ age categories have the highest suicide rates while the 15-24 years olds have the lowest. Durkheim would argue that these rates are social facts and that at the core of the problem lies social level processes that either facilitate or inhibit personal choices by exerting social pressures. Karl Marx (1818-1883) was an influential person in the development of sociology as a strong academic discipline. He was not a sociologist. He was an economist, philosopher, and revolutionary. Marx was born in Germany and his writings on the class struggles that existed in society wherein the poor masses are exploited by the few wealthy elite still apply today (perhaps even more so than in his day). His philosophy and the timing of his writings helped early sociologists in the development of social theories and scientific approaches. We will talk more about Marx and Conflict Theory in Chapter 3. Another key German founder of sociology was Max Weber (pronounced vey-bur) (1864-1920). He was a very intelligent person who strongly influenced the development of sociology and taught some of the other early sociologists of his day. Weber studied economics and his work gave balance to Karl Marx's extreme ideas. He studied religion and the economy and published a work called, "The Protestant Ethic and the Spirit of Capitalism." He also studied bureaucracies and defined Ideal Type as the abstract description of a social phenomena by which actual social phenomena may be compared (You'll see an ideal type in Chapter 9 on caste versus class economic systems). Ideal Types are given as hypothetical examples and we can compare current economic systems to them. Another early sociologist was a British man named Herbert Spencer (1820-1903). Herbert is remembered for his failed ideas about survival of the fittest in society (not the animal kingdom). He is most remembered for the sociology that wasn't. In other words, he believed that survival of the fittest applied to classes within society and that the wealthy aristocrats were the fittest. Whatever the wealthy people did was in effect better for society in the long run. The problem with his philosophy is that it was not supported by scientific inquiry. In fact his complex ideas were interesting, but not a good explanation of social processes and their causes when put to scientific rigors. Eventually scientists adopted sociology in the US. Lester Ward is considered the founder of US sociology (1841-1913). Ward saw sociology and its potential to better the society in the US as tool. He emphasized the scientific methodology in using sociology to solve real world social ills such as poverty. He, like Martineau felt that women had rights and should be treated as equals (most in his day thought he was wrong about women at the time because the prevailing belief was the inferiority of women). Ward is the founder of US sociology and first president of the American Sociological Association (see www.asanet.org ). His sociological principles and processes are still utilized by many who work in governmental and social service sectors today. Another sociologist from the US was Talcott Parsons (1902-1979). Parsons was a Functional Theorist who did extensive work on Systems Theory (see Chapter 3). Parsons was also a president of the American Sociological Association and for a short period of time was the world's premier sociologist. His work at Harvard supported much of the professionalism sociology has today. Sociology began in France, Germany, the United Kingdom, then the United States. Sociology waxed and waned in popularity outside of the US over its short history. Today, sociology has become a United States-centered scientific discipline with most sociologists living in the US. There is significant sociological work being done in various countries of the world, but most of the 14,000 members of the American Sociological Association (the world's largest professional sociology organization) live in the US. During the 1920s and 1930s the Chicago School was a center for sociological research that focuses on urban and ecological sociological issues. Within the Chicago School were 2 other important US sociologists, Charles H. Cooley (1864-1929) and George Herbert Mead (1863-1931). Their work together gave tremendous support to the Symbolic Interactionism Theory (Chapter 3). The construction of how we form the "I" and the "me", the self-concept, and the looking glass self (see Chapter 6) was crucial and is still widely used in today's scientific inquiry. Chapter 01 - History and Introduction | United States Sociology: A Career?